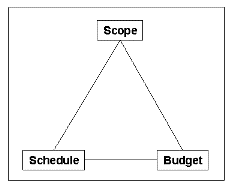 Scope: all the work we have to do in order to create the clearly specified product. Schedule: the time we need in order to create that product. Budget: the total amount of money we need in order to create that product. If we change one cornerstone of the three, we influence the other two. For example, if we increase the scope - because of additionally required features of the product – then we obviously have to increase the necessary time and amount of money. Similarly, in order to shorten the time we could reduce the scope and consequently reduce the budget of that project. We also could shorten the time by involving more resources and thus, increasing the budget.